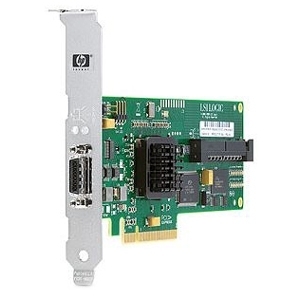 The SC44Ge 8-channel SAS RAID controller provides customers with the flexibility and speed they have come to expect from HP. The SC44Ge 8-channel SAS RAID controller is ideal for basic RAID (0, 1) and low cost connectivity to tape and HDDs. SC44Ge 8-channel SAS RAID controller supports both 3G SAS and 1.5 G SATA devices. Providing up to 2 Gb/s maximum bandwidth, this provides nearly four times the speed of a dual channel U320 SCSI adapters. The SC44Ge 8-channel SAS RAID controller has been thoroughly tested and integrated into many of the HP ProLiant and Integrity servers. The SC44Ge 8-channel SAS RAID controller supports both a 1 x4 internal connection and a 1 x4 external connection.